Don Drake is a hired killer. He currently owes a sizable debt to a demon and must perform another assassination to get rid of that debt. But things don’t go too well for Don in that assassination attempt. An innocent little boy is killed and the Furies start to pester him. Drake is ‘rescued’ by Trixie, a fallen angel (sort of). With Trixie and his sidekick/familiar whom he refers to as The Burned Man (a demon imprisoned in an idol), Drake will take on Lucifer in order to protect the world. The book holds to a lot of urban fantasy stereotypes — a main character who doesn’t want to be a hero, wise-cracking demons, and a real menagerie of supernatural creatures. I think it will be impossible to avoid comparisons to Harry Dresden. Drake comes across as a Harry Dresden type (male, about the same age (?) with a talent for magic and putting demons in their place. But Don Drake isn’t quite as smooth as Harry Dresden. Drake is an alcoholic gambler who gets lucky more often than not. I did get caught up in the story right away as Drake is playing a game involving some odd betting (I’m a game fan). And I was (and remain) curious about The Burned Man – sometimes he/it is helpful, sometimes not so much. This talisman/demon also reminds me of Dresden (as in Bob the Skull). Mostly I felt that author Peter McLean recognized the similarities between his story and Jim Butcher’s creation and was trying too hard to make Drake different, but the ‘cool rogue’ attitude becomes ‘obnoxious jerk’ at times (which is something I find quite often in fantasy literature). Drake shows some promise but this book doesn’t stand out in a very popular genre. Looking for a good book? 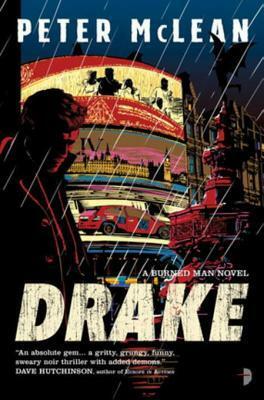 Drake, by Peter McLean is an urban fantasy that is fun at times but doesn’t show a lot of originality.